I’m ecstatic to be posting this recipe, because it feels like a huge accomplishment to get here after all of my failed attempts at this one. Lovely A Cookable Feast readers, say hello to my Pumpkin Buttermilk Pancakes recipe [Cue noise-makers and vibrant confetti and kittens on tricycles yielding congratulatory banners and all manner of unbridled whimsy]!!! 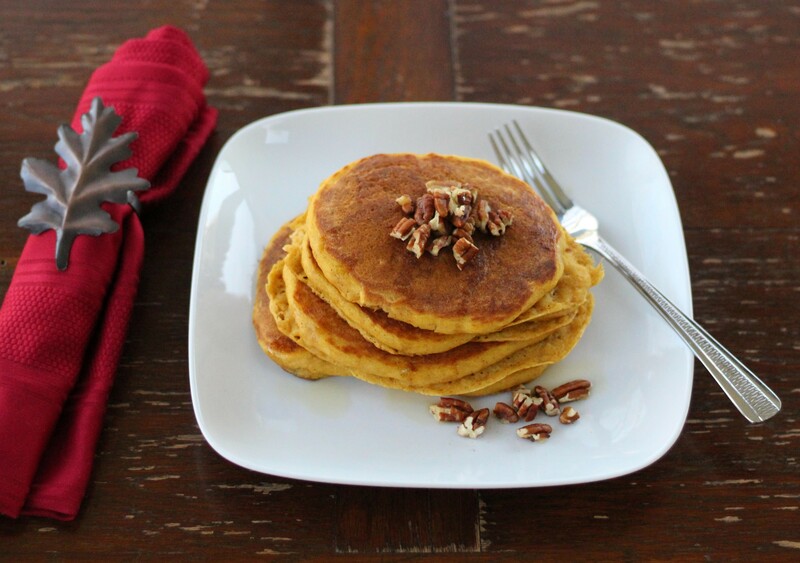 This Pumpkin Buttermilk Pancakes recipe took the most attempts for me to develop of any recipe I’ve created – six total. I’ve worked on it over the last several weeks and was this-close to giving up on it until I took a different tack Sunday (oil instead of butter; more baking powder; adding baking soda, etc.) and came up with sweet, sweet, SUCCESS! I need to get better at failing, indeed. I should probably be grateful to these Pumpkin Buttermilk Pancakes for exposing me to more failure, because isn’t there a time-tested axiom or meme or something out there declaring that failure is the key to success? At any rate, I breathed a sigh of relief when I took a bite of the latest batch of these Pumpkin Buttermilk Pancakes and tasted their fluffy, flavorful, cinnamon-kissed, melt-in-your-mouth yet cooked-through perfection! No more pancakes with undercooked middles to add to the collection in my freezer (that was my big problem there for a while; I’m guessing it had something to do with my batter being too thick). I was never one to make pancakes with buttermilk prior to these Pumpkin Buttermilk Pancakes, but now that I have, I can’t see myself going back to my non-buttermilk days. The rich, creamy cultured milk adds an irresistible tang to the cakes. And adding pumpkin to the mix was a no-brainer because I’m always looking for an excuse to eat it at this time of year short of gobbling it straight from the can (which I’m certainly not above doing). Since eating pumpkin pie for breakfast on a consistent basis doesn’t strike me as the wisest choice (except perhaps when paired with a five-mile run), I’m opting to get my fix in the form of these Pumpkin Buttermilk Pancakes with their cinnamon-and-nutmeg-kissed, processed-sugar-free (they’re sweetened by adding pure maple syrup to the batter) deliciousness. While I’ve got excuses-to-eat-pumpkin on the brain: if you like these Pumpkin Buttermilk Pancakes and are looking for yet another reason to use pureed pumpkin in a breakfast item, check out my Pumpkin Cinnamon Waffles with Blackberry Sauce recipe. Those little babies are a delight, if I do say so myself! And if you like granola, you may enjoy giving my Pumpkin Harvest Granola and Pumpkin-Raisin Granola recipes a looky-loo, too. No more talk about successes and fails – it’s time to taste the triumph! On to the recipe! 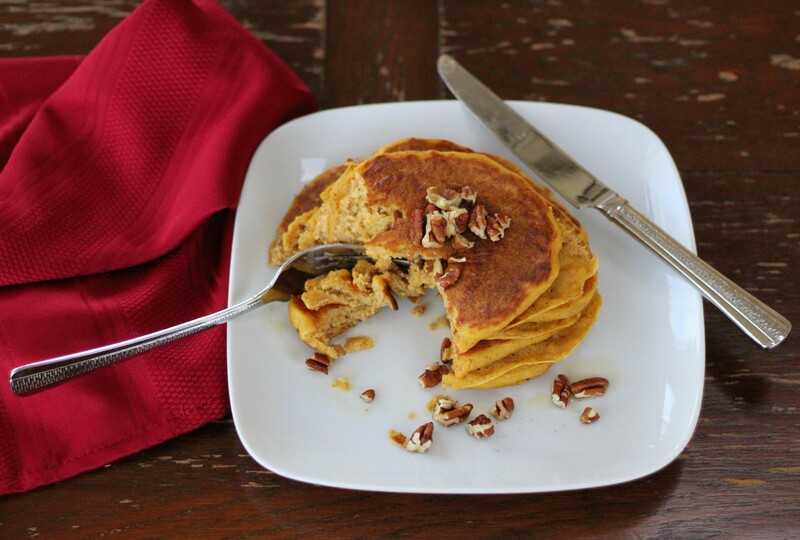 Melt-in-your mouth pumpkin pancakes with a delectable tang of buttermilk and cinnamon-nutmeg sweetness. 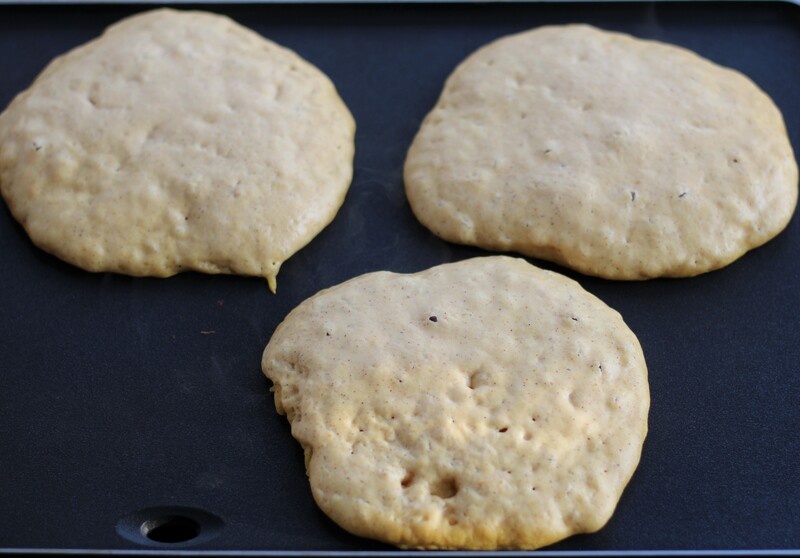 If using a pancake griddle, preheat to your desired temperature (375 degrees is generally good). In a large mixing bowl or mixing pitcher, mix all of the dry ingredients: the flour, baking powder, cinnamon, baking soda, salt, and nutmeg. Crack the egg and separate the whites from the yolk, putting the whites in one bowl and the yolk in another. Beat the whites until foamy bubbles form. 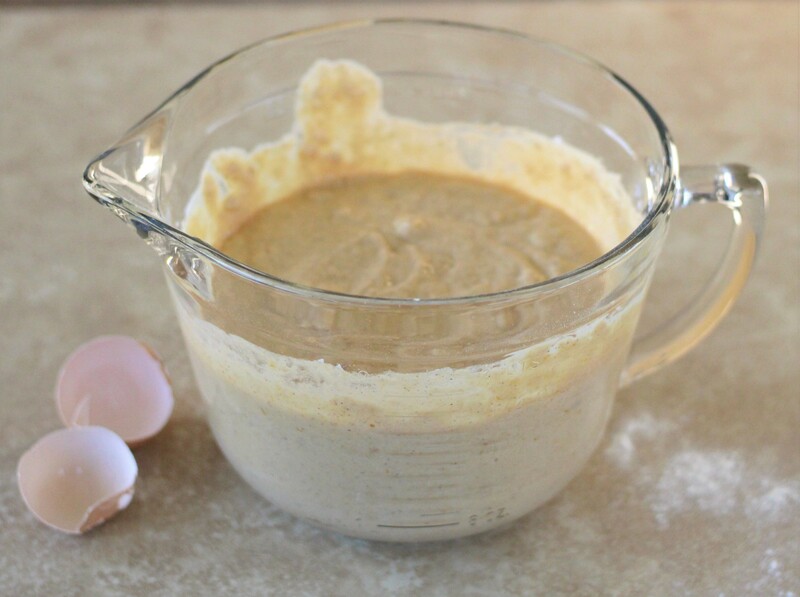 Mix the egg yolk in the third bowl with the pumpkin puree, then blend in the other wet ingredients: the buttermilk, oil, water, maple syrup, and vanilla extract. Stir in the foamy egg whites just enough to incorporate them throughout the other wet ingredients (you want to still see some of the foam bubbles). Add the wet ingredients to the dry ingredients and mix just enough so that all is melded together and there is no lingering flour at the bottom or sides of the bowl (some lumps in the batter is good). To your griddle or greased frying pan over medium-high heat, spoon out the batter to make pancakes of your preferred size. Pancakes will typically be ready to flip when small bubbles start forming in the batter on the sides facing up, about three minutes in. Flip the pancakes and let cook another three minutes, or to your desired doneness. Serve with pecans, butter, and maple syrup or other preferred toppings.